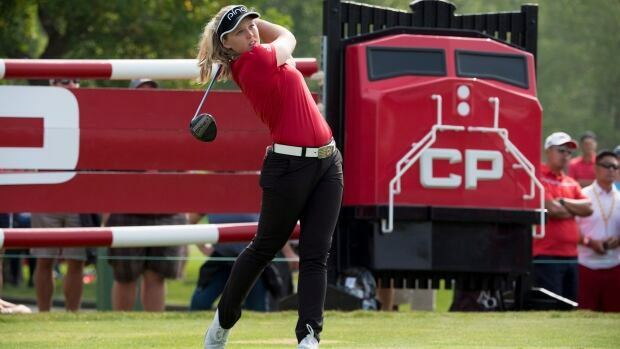 Canada's Brooke Henderson has managed to score in different ways at the CP Women's Open. By doing so, she has set herself up nicely near the top of the leaderboard at the halfway point of the tournament. Henderson fired a second straight 66 on Friday at the Wascana Country Club in Regina to sit one shot behind clubhouse leader Amy Yang of South Korea. "I hit the ball in good spots and made birdie putts when I had them," Henderson said. "I feel like I made the most of today's round, which is always a great feeling. "To be close to the top of the leaderboard heading into the weekend is awesome, especially when you're here in Canada." Yang shot a 65 to move into top spot at 13-under-par 131. American Angel Yin (67) joined Henderson in second place with several groups still on the course. Defending champion and world No. 1 Sung Hyun Park of South Korea was three shots off the lead after tying the course record — set a day earlier — with a 64. She was joined at 10 under by first-round co-leader Nasa Hataoka of Japan (70) and Maria Torres of Puerto Rico (66). Starting on the par-4 10th hole, Henderson chipped in on her opening hole for birdie. She added three more birdies over her next five holes before missing a three-foot putt on the 16th for a bogey. Henderson, a six-time winner on the LPGA Tour, had some luck on her side, too. Her drive sailed right on the 18th hole, hitting a grandstand post on a bounce before settling in the rough. Henderson found the green with her next shot and two-putted for par. Five pars followed after the turn before Henderson found a late groove. She hit a tricky four-foot downhill putt on the sixth hole and drained a 22-footer from the fringe for another birdie on the seventh. "Definitely have a lot of confidence in (my putter) this week, which is always amazing when you can depend on that club," she said. "But I think overall, everything is kind of going really well." The 20-year-old from Smiths Falls, Ont., capped her round by going up-and-down from the side of the ninth green for birdie to the delight of the partisan gallery. "Brooke is almost like Canada's Tiger Woods," said Park, who played with Henderson and Sweden's Anna Nordqvist. "I was really surprised at how many fans came out to support Brooke today. To witness that was pretty awesome and it helped me enjoy today's round." Americans Mariah Stackhouse (69) and Austin Ernst (69) were at 9-under-par 135, one shot ahead of Nordqvist (66) and several others. It was hot and sunny again on the 6,675-yard course but the wind picked up considerably later in the day. First-round co-leaders Ariya Jutanugarn of Thailand and Colombia's Mariajo Uribe had afternoon tee times. Anne-Catherine Tanguay of Quebec City (71), one of 16 Canadians in the field, was a good bet to make the cut at 3-under 141. The early projected cut line was 2 under. Play continues through Sunday at the $ 2.25-million US event.